Posted on June 11, 2012 by Alicia Bay Laurel	in Blog and tagged press. Truly a wonderful tour. I enjoyed every day of it! May 27 live at Natural High Festival at Doshi, 11:20 to 12:00. Otherwise I’ll be at Kurkku/apbank booth. 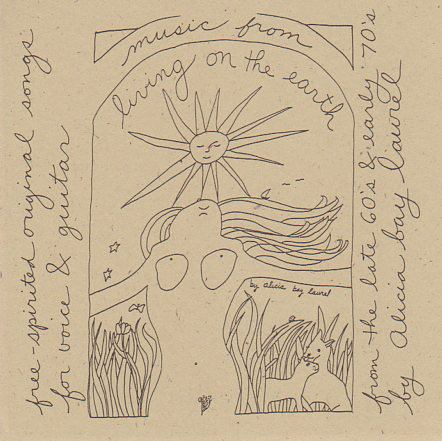 June 14 live at Cay in Aoyama, Tokyo with Inoue Ohana Band, start 20:00. 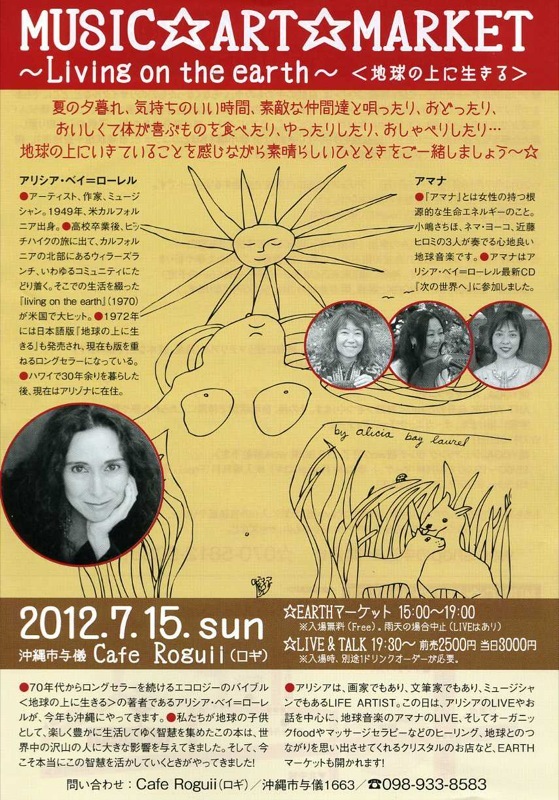 June 19 Art workshop and live performance at Holistic Health Care Institute in Kichijoji, Tokyo. 18:00 Â– 22:00. June 21 live at Thumbs Up in Yokohama with Inoue Ohana Band, start 20:00. June 22 live at Chikyu-ya in Kunitachi, Tokyo, with Inoue Ohana Band, start 19:30. 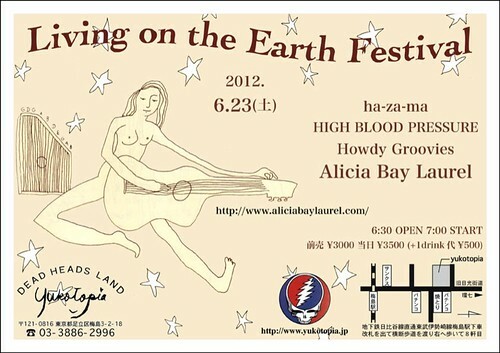 June 23, live at Yukotopia in Umejima, Adachi, Tokyo, with Ha-Za-Ma, High Blood Pressure and Howdy Groovies. Doors open at 18:30, live begins at 19:00. I play last. June 24 live at Alishan Organic Center in Hidaka, Saitama, 16:00 start. June 29 live in Fukushima at Ginga No Hotori (Edge of the Milky Way) CafÃ© with Yoshie Ebihara, Inoue Ohana Band and Kaorico Ago. A gift to the Tohoku people from Little Eagle. Doors open at 17:00, start time 18:00. 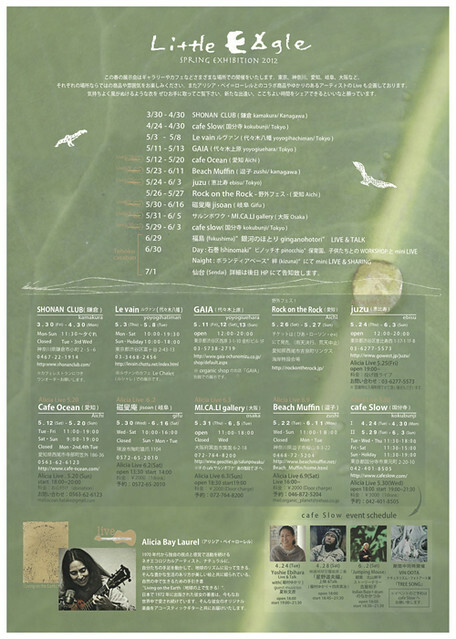 June 30 live in Ishinomaki at Cafe Roots with Yoshie Ebihara, Inoue Ohana Band and Kaorico Ago. A gift to the Tohoku people from Little Eagle. Doors open at 18:00, start time 19:00. July 1 art workshop (making fabric picture books) in Sendai, co-led with Kaorico Ago 13:00. Live with Yoshie Ebihara and Kaorico Ago at 15:00. Location: Akiu Kinoie Center. A gift to the Tohoku people from Little Eagle. 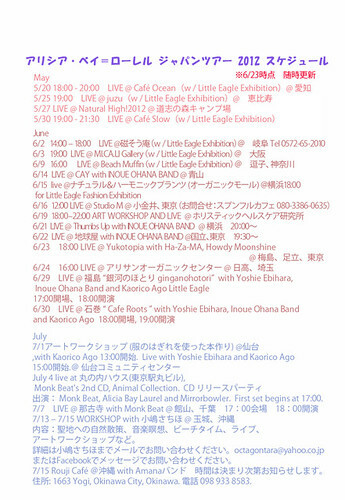 July 4 live at Marunouchi House (close to Tokyo station), CD Release Party for Monk Beat’s 2nd CD, Animal Collection. Monk Beat, Alicia Bay Laurel and Mirrorbowler. First set begins at 17:00. July 7 live at Nagoji Temple in Tateyama, Chiba, with Monk Beat featuring vocalist Yae. Doors open at 17:00, show starts at 18:00. A fundraiser for Tohoku survivors. July 13-15 Â– Weekend workshop in beautiful Tamagusuku, Okinawa, co-led with Sachiho Kojima, including nature walks to sacred sites, musical meditation, beach time, live music, and shrine-building art workshop. To join us, or for more details, please contact Sachiho at octagontara@yahoo.co.jp or message Sachiho on Facebook. July 15 live at Roguii Cafe, Okinawa, with Amana band. Doors open at 19:00, show at 19:30. Cafe address: 1663 Yogi, Okinawa City, Okinawa. Phone: 098 933 8583. Hand craft and farmers market at the cafe from 15:00.